I am so super excited to be a part of the 1st Annual Great Food Blogger Cookie Swap! The cookie swap had over 600 participants in it’s first year… I’d say that was a HUGE SUCCESS! I was paired up with two other fabulous military wives and bloggers here in Europe to send a dozen of my homemade cookies to! These fabulous ladies received one of my most favorite recipes for holiday cookies, but with a twist! 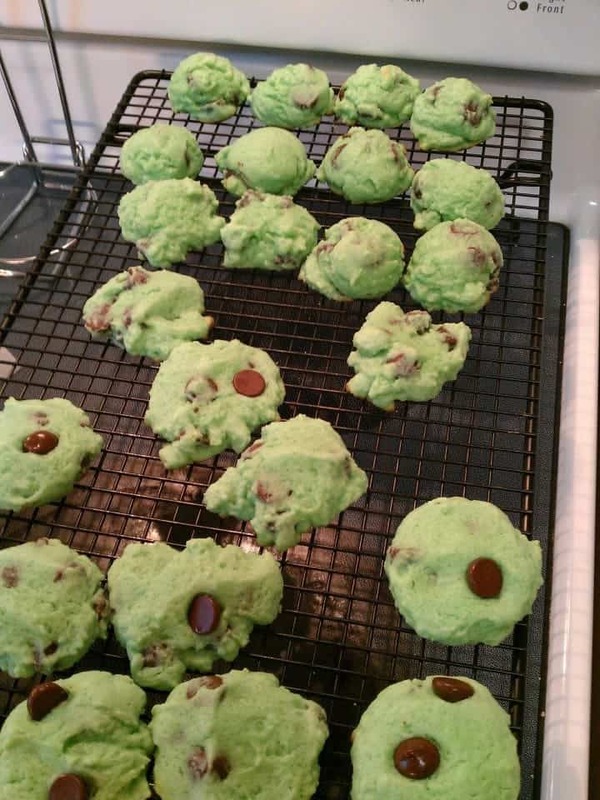 I took my tried and true recipe for sugar cookies and added a little mint, dark chocolate chips, and green food coloring turning them into “Grinch Cookies”! Green and black mint chocolate chip cookies! Seriously so YUM! In the bowl of a stand mixer, using the paddle attachment, cream the butter and sugar together. Add the eggs and beat on high for 2 minutes or until smooth and fluffy. Add the peppermint extract and food coloring and mix until all the color has been combined. Make sure to scrape the sides of the bowl to make sure all the color is incorporated. In three parts, add the flour. Between each addition add a tablespoon of milk. Mix flour only until combined. Cover dough and place in freezer for 20-30 minutes or chill in refrigerator for at least an hour. While the dough is chilling, preheat your oven to 400 F degrees. Line a cookie sheet with parchment paper. After the dough has chilled, scoop 1-1 1/2 inch balls onto the cookie sheet 2in apart. Press each ball gently until flat (unless you want little round ball cookies, then leave them round). The rounder the edges of your cookies, the rounder they will bake. If you like imperfection like I do… just leave them with jagged, rough edges. I pressed a couple extra dark chocolate chips into the top of a few of the cookies, just cause it’s pretty! Bake 7-8 minutes. Do not over bake! You want the bottoms to just begin to get golden, brown but not dark! Leave cookies on pan for 30 seconds before removing to a wire rack to cool completely. Thats too cute- “Grinch cookies” Love it! Just made these for an office Christmas party, so tasty! Thanks for an amazing recipe!